The pump is not fantastic and can be improved. Another week, another interesting inflatable board up for review. It kind of feels like the inflatable SUP segment is abuzz with productivity and creativity. Having reviewed the Solstice Bali and theWekender, I was certainly looking forward to what the iRace by Tower Paddle Boards had in store for me. On the surface, the Tower iRace is purely built to go as fast as possible on the water; which in itself is an accomplishment, considering it is an inflatable board. The body is long, sleek, and narrow, accentuated by a colour scheme of black and white stripes that gives the impression that it is a fast beast. What works in the board’s favour is its lightweight design. At 27 lbs, the inflatable SUP is certainly lighter than some of its peers. This provides an excellent segue to my next point. The lightweight nature of the board will allow you to carry it around anywhere you go. Tower Paddle Boards is marketing the SUP as a ‘racer on the go’. An easy to grip carrying handle works in this regard. When deflated, the board can be rolled up into a compact 12”x33”. One thing that can definitely be said is that you will face a minimum of fuss transporting it from one location to another. 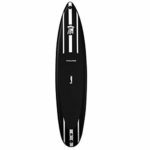 The inflatable SUP’s sleek body blesses it with the ability to go fast in a straight line. Everything about it has been designed specifically for that singular purpose. For instance, its nose break. The iRace’s body has been shaped to taper at the front. This allows you to not just cut, but almost slice through the water’s surface. Each paddle stroke that you put in will have you moving ahead faster. Speed is good, but stability is just as crucial, especially if your board is filled with air. 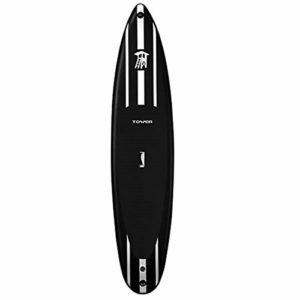 Here too the inflatable board comes good with a 30-inch wide body and a 6-inch thick frame that spells stability. When you set foot on the board, it gives you the confidence to push at your maximum without the fear of tumbling over. An extra note on the board’s stability: It gives the iRace an extra dimension of an everyday recreational board. 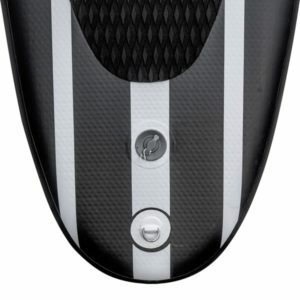 This will appeal to folks who are looking for a fast board with balance. The one thing that I would have liked to see is a tapered tail as well. The current design gives the rear a somewhat rounded shape. A more oval design and the board could have been a real fast one. The one concern that most people have with inflatable boards is whether they will buckle midway. To address that very concern, the Tower iRace has been reinforced with military-grade PVC. The board’s structure is held together with thousands of vertical strands that form a strong connecting layer between the top and the bottom. When inflated at its recommended pressure,15 psi, you will feel a similar kind of rigidity that you experience on the hard boards. One of the advantages of the iRace is that it can be used in a variety of water conditions. In clear waters, it can go fast; in choppy waters, you can maneuver the board with little effort. It is kind of versatile enough for you take it out for a ride on the lake or the ocean. Now all boards come with their set of accessories. Some of them are good, while others are ordinary. The iRace too has its share of the ordinary, which I will get to later. Here, I wish to talk about something that it gets right – the paddle. Of the paddles that I usually find attached with boards, the Tower iRace certainly has one of the best. None of the cheap, aluminum-inspired stuff here. What you get instead is a good fiberglass creation. 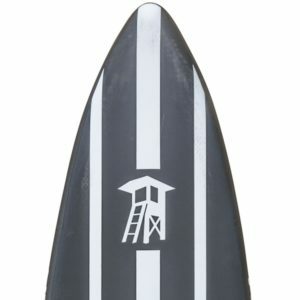 Like the board, it features a long, telescopic design, aided by a good grip. You will certainly find better paddles out there if you are serious about racing, but the paddle provided with the board is a very good one. It is kind of strange that most inflatable boards suffer a common affliction – a poor hand pump. What is even surprising is that it is an integral part to an inflatable SUP. If you cannot pump air into the board, how will you ride it? The manufacturers don’t seem to have an answer as once again an inflatable board is saddled with an inferior pump. The iRace’s pump can get the job done, but it takes some effort and a certain amount of time to get it done. And you need to practice as well. This can puncture the excitement of taking the board out and racing it. 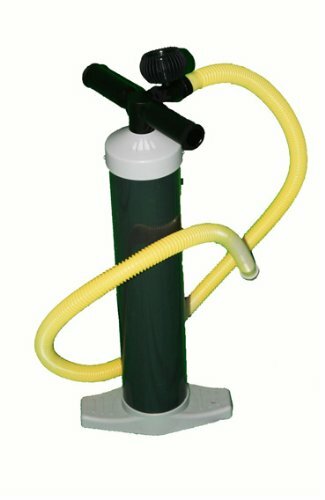 My advice: Get your own hand pump, preferably an electric one. The other issue I faced is that when you spend enough time on the board under the sun, your feet will get hot. The same black and white design that makes the iRace looks hot, makes it hot as well. Now you could argue that it is a race board and not designed to spend much time on the water. But I am sure the manufactures can do something about it. I hope they are listening. The Tower iRace is very good at what it promises to be – speed. You will certainly find yourself covering the same distances in a shorter period of time. The board’s design and added stability also allow it to be used by newbies as well as the more experienced. Its USP is that the iRace is one tough board that can be transported through hell or high water and can still be used. If you are looking for a versatile racer, the iRace is definitely worth considering. If you are looking for an out-and-out speed demon, then you are better off looking at other premium options, especially in hardwood. Cool review, btw I only weigh 180 lbs, would it matter in terms of being stable in the water if I use this board?